Preheat oven to 350 degrees. Beat butter and brown sugar with an electric mixer until smooth. Add eggs, one at a time, beating well after each addition. Add vanilla, ginger, and salt and beat well. Add ¾ cup minced dried cranberries and 6 ounces chopped white chocolate into the batter and mix by hand. Pour batter into a well-greased 9 x 13″ baking pan and spread evenly. Bake for 30 to 35 minutes or until cake is light brown on the top. Allow to cool. Make the frosting: combine cream cheese, powdered sugar, lemon juice and vanilla and beat with an electric mixer until smooth. Spread frosting over top of cooled of cake and sprinkle top with diced cranberries. Make icing: with a fork, mix together powdered sugar, milk, and butter. Using a pastry bag or plastic bag with a fine tip cut at the end, drizzle icing over cranberries in a sweeping or zig-zag motion. 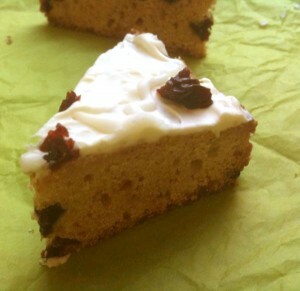 Refrigerate for several hours, then slice the cake into small triangles. Based on a Todd Wilbur “Top Secret” recipe.